I can barely think of a home improvement job that doesn’t require a tape measure! 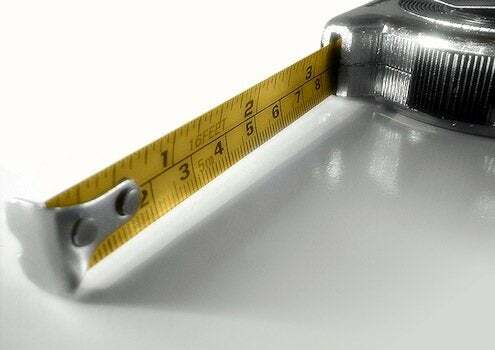 Whether you’re framing a new room or just hanging a few pictures, a tape measure is a must. For small jobs, a six-foot retractable tape measure with a half-inch-wide blade may be all you need. For bigger jobs, it’s helpful to have a tape measure that’s not only longer but also wider—a wider blade can extend to greater lengths in a straight line, without sagging or wiggling. For most homeowners, a three-quarter-inch-wide tape measure in a 16- or 25-foot length will handle most jobs. Look for a model with a brake that lets you lock the tape measure in place, so it doesn’t retract while you’re still calculating. Other helpful features include markings on the tape other than just inches—like easy-to-read markings at each foot increment, or marks every 16 inches to help you locate wall studs. For truly big jobs, you’ll want a wind-up tape measure in a 50 or 100 foot length—these have a ring at the end you can slip over a nail to hold it in place as you walk away.